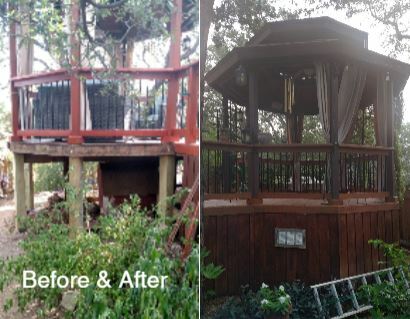 Sierra Arbor Estates Redecking Project Saves Clients’ Deck and Gazebo, Too! Here’s a tip: if you don’t have your aging deck replaced, you may never know your gazebo is in danger of collapsing. 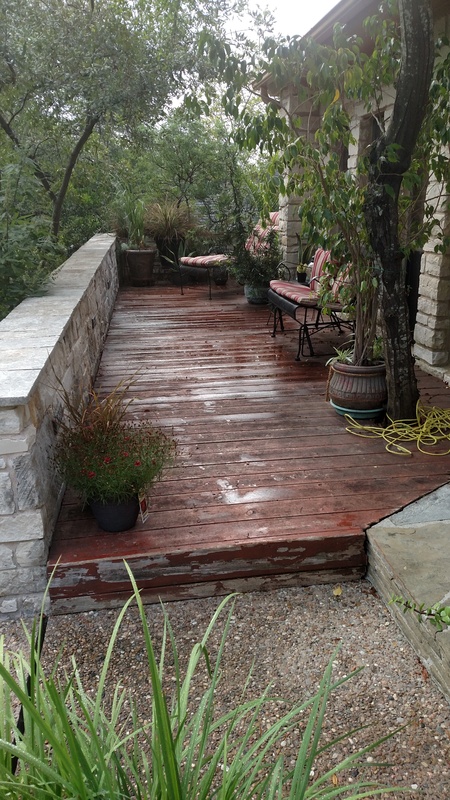 In North Austin, TX, the Sierra Arbor Estates deck project you see pictured here illustrates that point. Before — aging deck in need of a refresh! 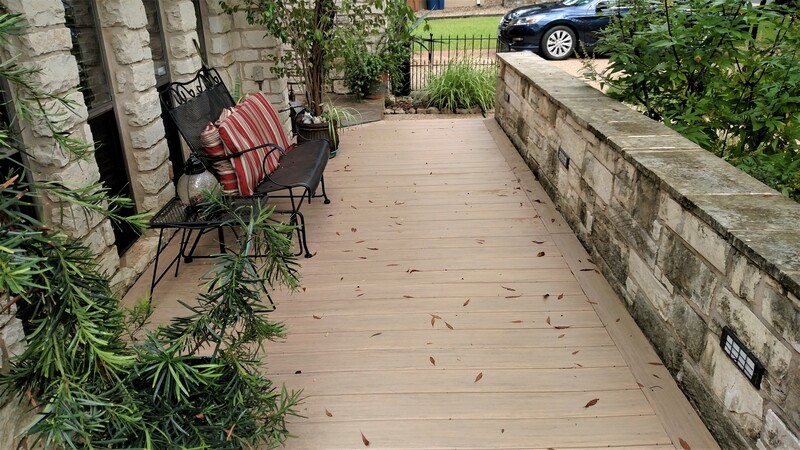 After Archadeck of Austin redecked this space with AZEK low-maintenance decking. You’ve heard the expression, “One thing leads to another,” right? Sometimes homeowners are very, very glad one thing led to another when Archadeck of Austin comes around to create (or recreate) an outdoor living space. After Archadeck of Austin redecked and refreshed this space. These clients wanted to replace their small deck that wraps around the side and back of their house, bordered by a charming stone wall. Made of wood, the deck had decayed. Time for a replacement. Good fortune was on their side; the deck was a good candidate for redecking. Not all homeowners are aware that redecking is an option – and one that can save them money. Until we inspect your deck, we won’t know if redecking will work for your project, though. Why is redecking possible? The sun’s UV rays cause a wooden deck’s surface to deteriorate over the years. Meanwhile, the deck’s substructure is protected from the sun and doesn’t suffer the same damage. Before committing to redecking, Austin deck builder Archadeck of Austin will examine the support structure under your deck. If that structure is not compromised – if it’s still in good shape and can support a new deck surface for a good many years – we can use it again. That saves you some of the cost of materials and labor to build your new deck. 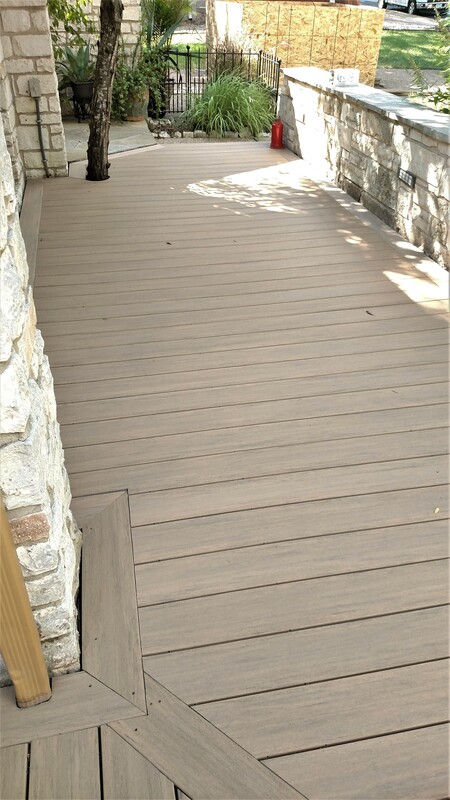 For their new deck surface, these homeowners chose AZEK synthetic decking boards in the popular weathered teak color from their Vintage Collection. With an AZEK deck, these homeowners will not have to worry about deterioration. These decking boards will resist splitting, cupping, splintering, blistering, peeling, flaking, cracking, rotting and structural damage from termites or fungal decay, and they are covered by an excellent manufacturer’s warranty. So … about that gazebo we mentioned earlier. One end of this deck extends out to a gazebo in the back yard. We found that the gazebo hadn’t been built correctly. It was actually bowing, its support piers sinking into the ground because the concrete footers could not carry the weight of the gazebo. Honestly, this might have been a disaster in the making. Archadeck of Austin to the rescue! We removed all the skirting and were able to pull out the original support posts and install a proper footing system under the gazebo. In that process we leveled the surface, so everything is level now. 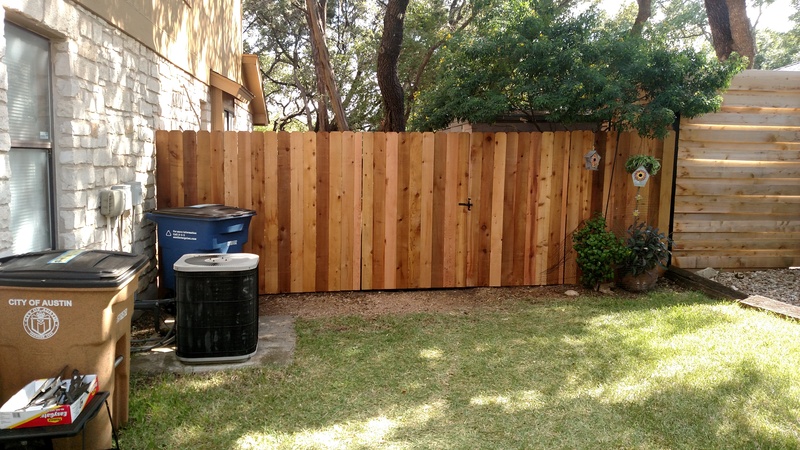 Finally, we wrapped up this project by replacing about 15-20 feet of the clients’ wood fence, gates and hardware because the original fencing that bordered the yard had also seen better days. These North Austin homeowners are happy now that peace and safety have been restored to their pleasant getaway-at-home. Could you save money by having your older deck redecked instead of replaced completely? Let Archadeck of Austin take a look at your deck to determine if it is a candidate for redecking. Call us today at 512-259-8282 or email us to schedule your free design consultation. This entry was posted on November 16, 2018 by austinporchandpatio. 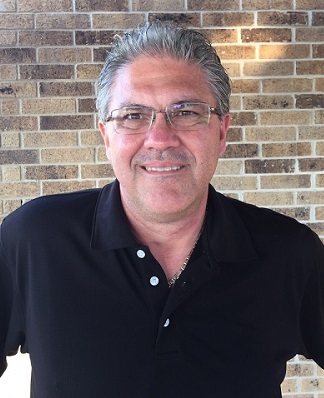 It was filed under Archadeck of Austin, Austin decks, AZEK, Re-decking and was tagged with Archadeck of Austin, Austin AZEK deck builders, Austin AZEK decks, North Austin AZEK deck builder, North Austin redecking.